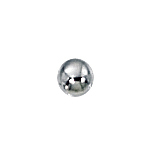 Sterling Silver 3mm Seamless Brite Beads with 1.2mm hole. This is our "original" 3mm bead with the larger hole. We also stock 3mm with the .9 hole.